Steve Born was associated with the University of Wisconsin from 1969 until retirement in 2005, where he was a Professor of Urban and Regional Planning and Environmental Studies. He has served as Chair of the Department of Urban and Regional Planning and the UW-Madison graduate Water Resources Management Program. From 1974 through 1977 Born served Wisconsin state government as Director of the State Planning Agency and later Wisconsin State Energy Director. He has also worked in natural resources and governmental policy planning in Thailand, Tunisia, Mexico, New Zealand and Australia. Steve Born has been fly fishing the pristine waters of the Driftless Area of the Midwest for years and it still lures him back again and again. Find out why this area is so special and learn Steve's secrets for being successful in these waters. Steve Born has been a principal in the development of Wisconsin's laws for lake and watershed management, groundwater protection, land use planning and mineral development. He has served as chairman of the National Resources Board of Trout Unlimited USA, the conservation agenda-setting body for the U.S. largest coldwater conservation organization; he has also served on the Boards of Directors of the River Alliance of Wisconsin, 1000 Friends of Wisconsin (President), Trout Unlimited Canada, Henry's Fork Foundation, and the Black Earth Creek Watershed Association. Steve has fished extensively across the western 2/3 of the US for more than four decades. Idaho's Henry's Fork, most of Montana's famous rivers, Yellowstone National Park, Alaska, and Wyoming and Colorado have been his major fishing haunts, and wild trout have been his favorite targets. 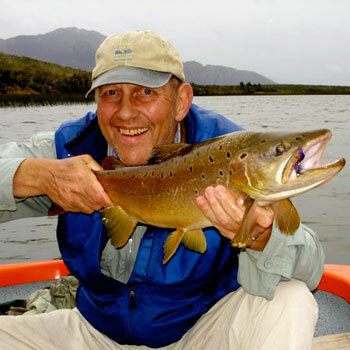 Steve has also spent many years chasing trout in New Zealand and Patagonia. He has also fished the shallow salt waters of the Bahamas, Costa Rica, Belize, Mexico and Florida for tarpon, bonefish and permit. But his favorite waters are his homewaters in the Driftless Area (the unglaciated portion) of Wisconsin. These magical small spring creeks offer wonderful dry fly fishing throughout the year -- from midges and blue-wing olives early in the season, to sulfurs and the big Hexagenia limbata night-time hatch in June and July on several streams, to caddis and cranefly hatches most of the summer, and terrestrial action throughout the summer up to the end of the season. Steve has become an addict of the Hex hatch, and spends some 30 nights a year chasing this hatch. Good streamer and nymph fishing exists year round. While most of our wild trout are in the 9-14 inch range, fish over 20 inches are caught regularly from these fertile waters. These streams can be technically challenging, demanding careful presentations and pinpoint casting -- skills that then come in handy in difficult spring creek-like fishing situations worldwide. For brook trout lovers, many of the headwaters now sustain a native brook trout population and Driftless Area states have undertaken major programs to restore the only salmonid native to the region. Steve is coauthor of Exploring Wisconsin Trout Streams (UW Press), and writes occasionally for conservation/angling periodicals.